01. Féile na Tuaithe - Turlough Park : Applications now being sought from craft and food producers. Application forms are now available for food and craft producers. If you are interested in taking part in Féile na Tuaithe, please visit our website for further details: http://goo.gl/UAuLvm . Closing date for receipt of all applications is Friday 21 March 2014. Further details also available from Lisa Fahy on feile@museum.ie . 11.00am-1.00pm. Drop-In-Activity. Knitting Circle: Spring out of Winter!. Adults & Children 7+. Join the museum knitters to make your own spring time knits and crochet. Start a new project or get help finishing an old one! Exchange ideas and tips. Learn a new skill for life. Beginners welcome. No booking required. 3.00pm-4.00pm. Tour. Documentation Discoveries. Adult. Tour behind the scenes, see and hear about some of the exciting and puzzling discoveries uncovered in the museum collection. Booking required. 11.30am-1.00pm. Drop-In-Activity. Mayo Genealogy Group. Adult. If you have an interest in finding out about your family history come along for free practical tips with the Mayo Genealogy Group. No booking required. New researches welcome. 2.00pm-2.30pm. Talk. Genealogy Talk: Wakes and Burial Customs. Adults. Join William Lyons for a talk on Mayo burial customs, find out more about associated ceremonies and traditions. No booking required. 3.00pm-4.00pm. Talk. Top Tips for Spring Gardening. Adults & Children 7+. Join Padraig Horkan for a talk on the top tips for your garden in Spring. Find out about companion planting and how to get much more out of your garden. Booking required. 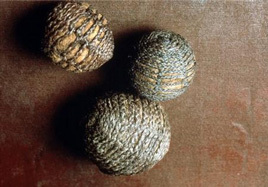 The inspiration for this exhibition by artist Tom Meskell, came from the collection, and x-rays, of hurling balls featured in the Museum's current Hair Hurling Balls exhibition. All of the paintings in this new exhibition are oil on canvas and will be displayed in the Museum Café until the end of March 2014. Visit http://www.tommeskell.com/painting.html to see a slide show of this work. For further information please contact Tom Meskell on Tel: +353 94 93 67616, email: tommeskell30@gmail.com.